An Accidental Cliché: How do you tuna fish? Who photoblogs a picture of a tuna-fish sandwich? Uh, this guy. Taken at a great hour around 6-7pm, indoors but near the front door. Canon 50mm F/1.8 lens, tripod, (homemade) remote control, 1/3rd of a second shutter and F/1.8 aperture. I did some experimenting with exposure, and this one came out the best by far. So why a tuna-fish sandwich? Firstly, because I'm hungry. Secondly, this one is unique. Its my sushi-inspired tuna sandwich. I got the initial idea from allrecipes.com, which was essentially a tuna salad with some wasabi and ginger. I made the same, added some soy sauce and a little relish (nothing asian about relish) but it helps the whole hot and sour concept (and relish is always good with tuna). But my own take on the recipe is the lettuce topping. I topped this with a chopped mixed field green tossed in a dressing identical to that which always comes on salad at a sushi restaurant. I only had mixed greens, but to be more 'sushi-inspired' it should use iceberg lettuce. 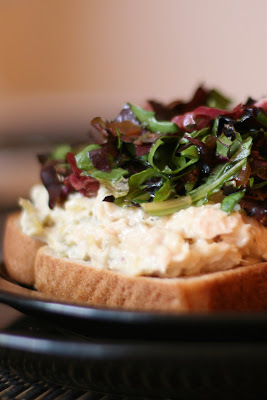 All in all, its an excellent modification of the classic tuna salad.